The women who write Remodelista featured this counter stool yesterday and I think it's my new favorite thing. Now I read Remodelista religiously. I admire their layout and their approach to blogging. These women are keen of eye and fast to spot something new and interesting. However, they have a tendency to list prices in Euros, despite the fact that they are based entirely in the US. This gets on my nerves. Not nearly as much as the way that the kids on Apartment Therapy (especially the ones based in LA) use British spellings, but it's close. Here's what I mean. 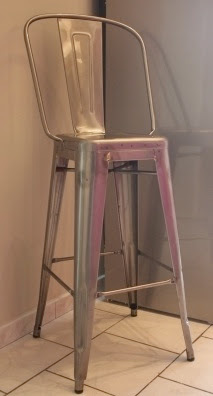 This lovely counter stool is the Tabouret Tolix avec dossier and it's available for €269 from Loftbutik.com. Ugh. Buying a counter stool from a French website when you're not in the EU is a pain, and an entirely unnecessary one when there's a perfectly fine US-based supplier in awaiting your inquiries in Chicago. So the easy and approachable low down on this counter stool is this: Tolix is the manufacturer, and tabouret avec dossier means stool with back. It's available in the US for $395 from Antiquaire. Antiquaire also has the tabouret avec dossier in painted finishes for $375. See? Easy. I'd be disappointed if you didn't use British spellings, it's in your national character's DNA. People US-bred and born using it smacks me as a cheap way to come across as cultured. So please, pepper my comments section with colours and behaviours; catalogue your defences; analyse manoeuvers in your pyjamas; centre your metre and keep eating doughnuts from Tim Horton's. Don't change a thing! Awww, but I DO love it. Got a suggestion for a better title? I do too! it's a wonderful bar stool. thank you for your comments on my blog - much appreciated!!! It's my pleasure Toni. You're an inspiration. I forwarded the link to your post today to a friend in London who lives for all things royal. He may be the last monarchist left in London but I doubt it. Anyhow, you have a new reader in London thanks to your detective work today. Cheers!